If you’re at all into genre fiction & television, you might want to click this one to read the headstones. I was feeling pretty silly, so there’s a bunch of silly pop culture references lurking in amongst the uneasy dead. Note the dandelion, the black cat, and of course the zombie hand bursting up out of Mr. Addams’ grave. 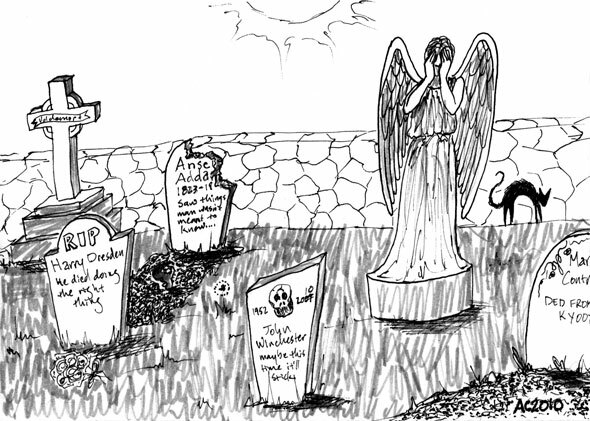 Graveyard, 5″x7″ pen and ink on watercolor paper. I could definitely think of friends to give this as a greeting card too. And not just for Halloween. I enjoyed this as well. Do I detect an undertone of sexual humor on the bottom right stone…DED from KY…overdose? I’m disturbed. Please pay me no mind. Unfortunately no, that’s meant to be LOLCat humor — Ded from teh kyoot. It’s interesting to see the in-jokes (of which they all are, one way or another, in this drawing) from the outside. Thanks! Disturbed is always welcome here.